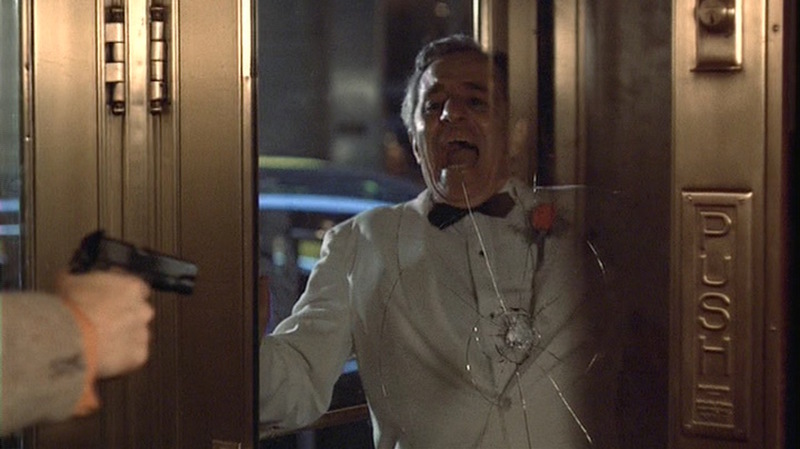 Alas, Willi rises from his completed shave, enjoys a leisurely smoke in the hotel stairwell, and – upon seeing Don Cuneo (Rudy Bond) step into the revolving door in his summer white dinner jacket – blocks the door and shoots the trapped don to death. Four years later, the fractured Corleone family is the subject of a Senate investigation. Willi Cicci, who defended himself ably after he and his boss Frankie Pentangeli were trapped in a bar, becomes a government informant for an enlightening and entertaining testimony reportedly inspired by real-life mob turncoats Joe Valachi and Joseph “The Animal” Barboza, the latter of which shares more than a passing resemblance to the swarthy Willi Cicci. Unlike his boss, Willi Cicci is one guy who is fine with dressing the part of the typical flashy mobster. 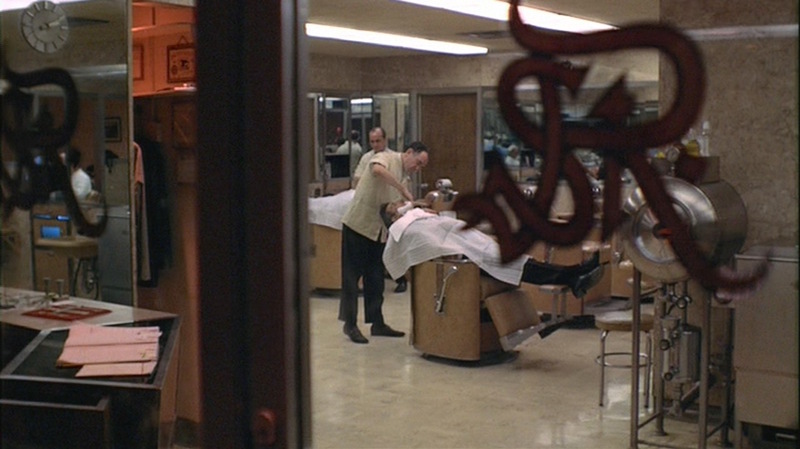 We are introduced to Willi toward the end of The Godfather as the nonchalant hitman is settling in for a shave in a hotel barbershop. Willi wears a gray sportcoat in what appears to be Donegal tweed with white flecks in the suiting consistent with that material. The ventless single-breasted jacket has notch lapels that roll to a low two-button stance that fastens at his waist. The shoulders are padded with roped sleeveheads, and a hint of a brown pocket square pokes out of the welted breast pocket. The jacket has patch pockets on the hips. Like a hunter stalking his prey… if hunters wore tweed jackets and bold silk ties. The jacket may earn the approval of discerning sartorial eyes, but Willi’s colorful choice of a shirt and tie may have said eyes rolling or turning away in disapproval. He wears a burnt orange shirt with a semi-spread collar, flapped breast pocket, and squared double (French) cuffs worn with a set of round gold links. Willie’s silk tie is broadly striped in purple, silver, and gold in the classic American “downhill” stripe direction, crossing from the right shoulder down to the left hip. Contrasting with his flashy upper half, Willi keeps things subdued below the belt with a pair of solid black trousers with turn-ups (cuffs), black leather cap-toe derby shoes, and black socks. 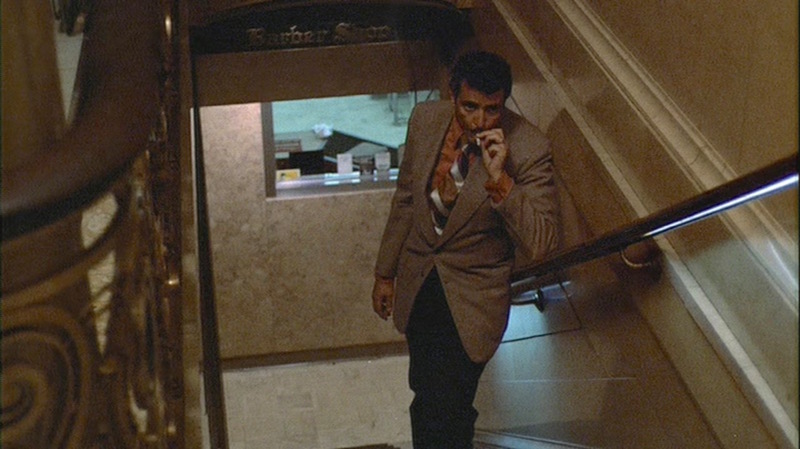 Those familiar with the demise of real-life mob boss Albert Anastasia may understand why this scene initially lowered my assumptions for poor Willi Cicci’s survival. For all of his flash, Willi wears a surprisingly conservative amount of jewelry for a gangster. He wears a gold ring with a dark stone on the third finger – rather than the pinky – of his left hand, and he sports a gold wristwatch with a round case and gold dial on a black textured leather strap. Willi Cicci makes the most of his pre-assassination waiting period. Gotta respect a guy with time management skills. 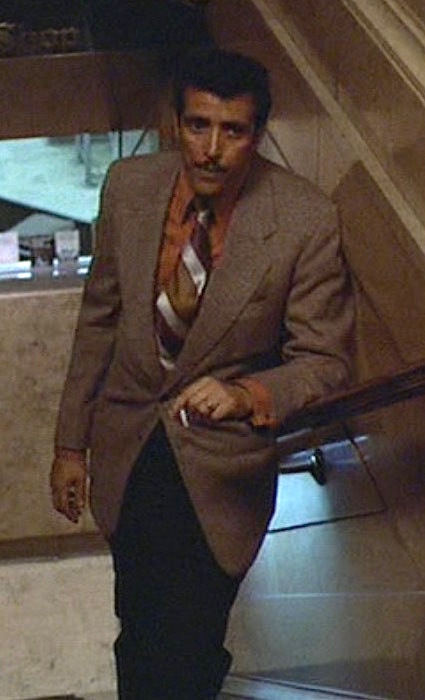 The next time we see Cicci, he is dressed down in a brown suede jacket, an open-neck shirt, and a pair of black sunglasses when informing Sal Tessio about a change of plans. Subtlety and color coordination aren’t exactly in Willi Cicci’s sartorial lexicon, as the slick hitman dresses with colorful pizzazz when embarking on his murderous deeds on behalf of the Corleone crime family. 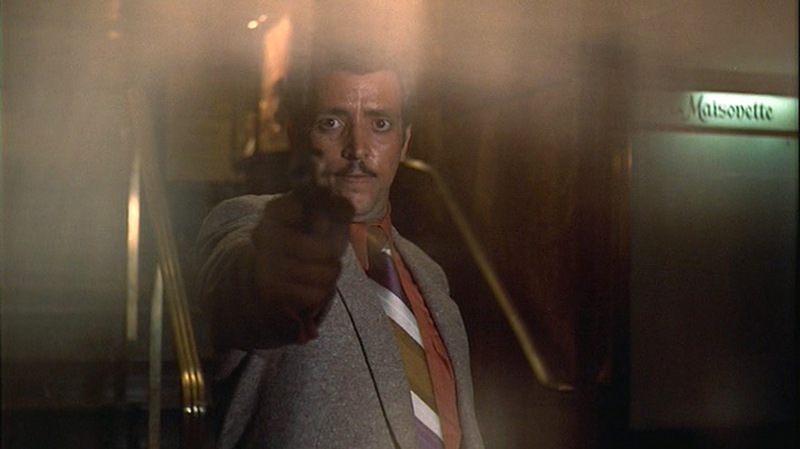 Willi Cicci uses a classic M1911A1 semi-automatic pistol as his weapon of choice for murdering Don Cuneo. Don Cuneo, himself no sartorial slouch in a white dinner jacket, meets his end at the hands of Willi Cicci. Unlike some productions of the era that swapped in the cosmetically similar Star Model B pistol for the ease of operating 9mm blank ammunition, Cicci’s handgun appears to be a traditional 1911 chambered for .45 ACP, based on the bore size and the lack of the Star’s brass external extractor on the right side of the slide. Check out the movie and the Godfather series as a whole. 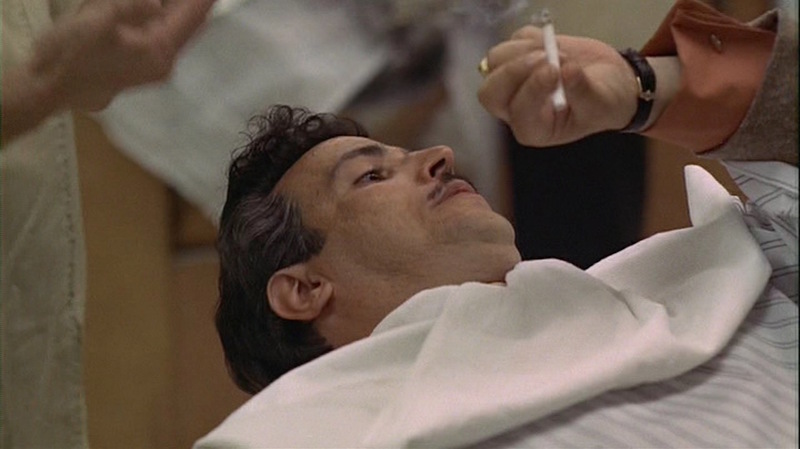 Willi Cicci was reportedly meant to be a more central character in The Godfather Part III, but Joe Spinell died after a tragic accident in his Queens apartment in January 1989 and his character was written out of the final script. Cicci’s story and role is slightly expanded in the video game, The Godfather, where his first name is alternately spelled “Willie” and he is depicted as a long-time member of the Corleone crime family dating back to 1946. 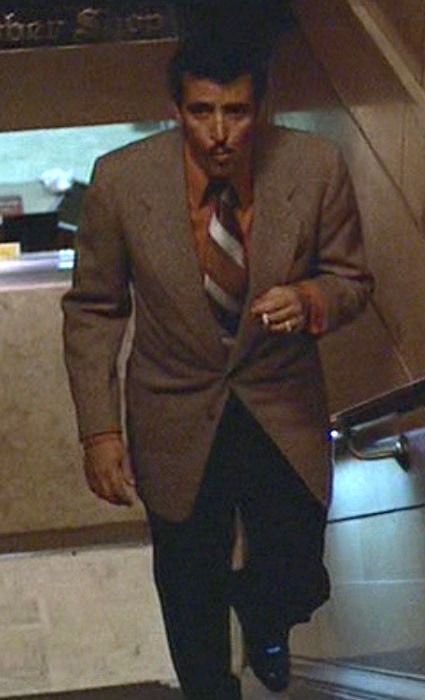 The game dresses Cicci in a gray suit, orange shirt, and striped tie clearly inspired by this colorful ensemble in The Godfather, though it tops him off with a gray fedora. This is probably one of my favorite BAMF entries for a few reasons. Chief among them, Spinell has long been a favorite character actor of mine, and I’m always happy to see him get credit for something. He was something of a sharp dresser in real life, too, in spite of his common screen image. It’s also a cool look at what wouldn’t have been that unusual of a color combination for a man in this era– though we tend to think of the 1950s as (mostly rightly) the age of the Man in the Grey Flannel Suit, clothing catalogs from the 50s do show a variety of shirt colors available as non-office alternatives to the usual white and blue. Fun fact: Spinell also has a strange distinction as a footnote in cinematic history– he and Steven Spielberg were good friends, and there exists home video footage of them hanging out together watching the announcement for Academy Award nominees the year Jaws came out. Spielberg’s reaction when he realizes Jaws got a best picture nom but he didn’t get best director is priceless, as is Spinell’s attempt to comfort him. Great post. I actually like the orange shirt and striped tie combo – flashy but cool. There’s a Godfather video game…? Good grief! Sure is. Came out about twelve years ago now, I think. It’s not bad– a GTA clone that casts you as a low-level Corleone enforcer who climbs the ranks of the organization and is present during some of the key moments of the movie. For a licensed game, a nice amount of love and work went into it, and there’s a nice diversity to the missions. For example, you’re the guy who hides the gun in the bathroom for Michael, puts the horse’s head in Woltz’s bed, you drive Don Corleone to the hospital after he’s shot, etc. After a while, though, it gets repetitive, especially as half of the game is comprised of a side quest that sees you extorting business owners for protection money. It’s fun in the beginning, but there’s so many businesses to extort, and a limited number of ways to extort the owners, that after a while you’re just going through the motions. It’s worth a look though for the nostalgia factor and for the main story component of the game.